My guest for this week’s Innovators show is Gavin Bell, author of Building Social Web Applications. A lot has changed in the decade since I wrote my own book on this topic. One constant, as we discuss in the podcast, is that we still reach for special terminology like computer-supported collaborative work or groupware or social software. That won’t be true forever. Sooner or later we’ll take for granted that all networked information systems augment us collectively as well as individually. Until then, though, it remains appropriate to speak of social web applications as opposed to simply web applications. Whatever we call this kind of software, it’s a challenge in this era of tech churn to write about it at book length. This effort succeeds by exploring patterns and principles that will endure no matter which technologies prevail. 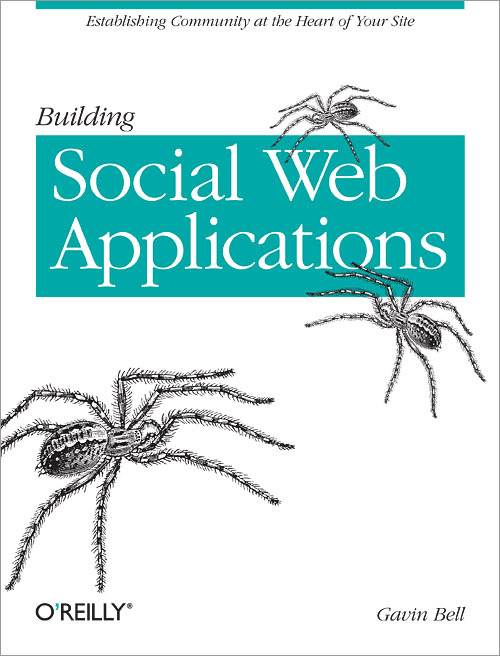 Yes, it’s an O’Reilly technical book, with the traditional animal picture on the cover — in this case, of spiders. But it’s not code-heavy. Gavin Bell aptly compares it to the polar bear book by Peter Morville and Louis Rosenfeld. Both books draw on a wealth of experience gleaned from building and evolving web applications. What are the social objects at the core of our application? How can relationships form around such objects? Which search, navigation, access, and notification patterns can best support those relationships? How do we evolve our application as our users gain experience with these object-mediated relationships? We’ll be thinking about these kinds of questions from now on. Gavin Bell’s excellent book provides a framework in which to do that thinking. I was just listening to your interesting talk with Gavin Bell. You mentioned the absence of a federated Twitter service. I assume you know about the open source StatusNet software (formerly Iconica) which is like twitter but has federation. Just wanted to mention it in case you hadn’t heard of it. Right, thanks for pointing that out. I am aware of it, but only because I travel in geek circles. As a mainstream proposition, we’ve yet to re-establish in the 140-character-message domain the same kind of loose coupling that the blogosphere began with and still exhibits. Fascinating. I just ordered Gavin’s book. One of the things Gavin mentioned is how different age groups use social media differently. My daughter complains that all old people use Facebook badly. Do either of you know if/where this kind of thing is discussed? Previous Previous post: Where is the money going?